Maggie, that's a really nice, usable template. Here is my Course Template. http://meaghanlister.com/elh-challenges/elh123 Here is the link to my blog post. 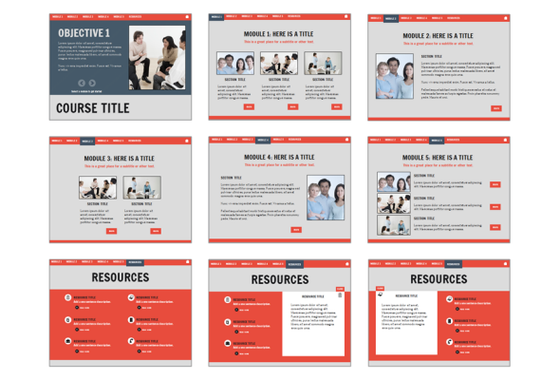 http://meaghanlister.com/2016/03/26/elh-123-course-starter-templates-for-e-learning/ You can download a copy of the Storyline template from my website. I'd love to hear any feedback. For some reason Meaghan, my computer is freezing on the slide after the Learning Objectives. I'll have to try again when I'm back at work. I like what I see so far, that green makes me think of spring. Thanks Linda. I was in a spring mode despite the freezing rain and snow outside today. I think that Google Drive is slowly depreciating support for hosting ahead of time. It seems to be less than reliable. I will have to come up with a new solution for sharing my files. I did include a number of screenshots on my website as well as the downloadable template. Megan I'm having the same issue as Linda, Your design looks really nice. Did you find a new solution to share your files? as I need one too! What a terrific template Meaghan, lots of layouts, looks great! Yes, same issue. Looks nice! Thanks for the pyramid, I Like this interaction. Okay, now I can see it all. It's obvious you put a lot of thought and work into all these interactions - great job Meaghan. I love the colours you have used Linda and the way the animations roll in from both sides. Great template! I love the red-grey color combi that you used. I like your visualisation, great. I agree about the bold colors and double sided animation. It's fun, crisp, and engaging. Well done. This course startah is a rockah Linda! Good simple colour scheme. Love the rocker! Here's my entry; https://googledrive.com/host/0B9Yp98HOToi1RGRGQUQ2YnpwdnM Here is another idea; https://googledrive.com/host/0B9Yp98HOToi1UU1UVGpJMzh3U2M I'd love to hear any feedback. I like the animations you used and the screened images Julia. The colors are fantastic. I especially love your two-toned checkmark. Brilliant. Thanks Debra. I appreciate the feedback. Hi Katelin, This has happened to me before. It may be it is set at Private instead of at Public in Google Drive in the Share section. oops. sorry about that. It should work now. Nice use of graphics and icons Katelin. Katelin, Congratulations on completing your first challenge. Nice template I like the pictures/icons did you draw them yourself? No, I used a free image website (FreePik) which is why the credit for the images is there, but in lettering that it not stand-out obvious. My colors came from the images though. Wow. Tremendous job. It's an engaging template with lots of visual interest. Good work. Welcome to the challenges Katelin, unfortunately, I get an error message when I use your link. I absolutely love this. The feedback of the side tabs is an elegant touch. Thanks, Cat! I appreciate that! This almost feels like a website; I like the versatility! So cool! I can see someone using this as an online portfolio! I like the colours and gradients that you used Piewsook. Thanks for submitting a more formal design. I have been wracking my poor brain being creative. Even so, I realized this week that several of my clients would prefer a more "formal" approach. Thanks for the gentle (and very well done) reminder. Thank you Debra! Some clients still wants to incorporate their brand and identity into the design. I thought I will build the template around this "constraint". Thanks Dianne, I was looking for that link. Thanks for the heads up, Dianne. I actually do that to see who reads my posts:-) The link has been updated in the resources. Thanks David - I never miss looking at the resources, but I did have to double-check this when no-one else mentioned it. I find it really interesting to see what approach everyone takes to these challenges. It seems that some jump in pretty with something they have already created that they think fits the brief (nothing wrong with this, don't get me wrong!) and others create something that doesn't really fit the challenge criteria at all. I always approach the challenges with a view to learning something, so following the links and reading the resources is what I do first. Whilst it's OK to be super-creative and enter something that everyone seems to like and comment on whether or not it fits the brief, my approach is to address as many of the challenge criteria as I can, based on the examples provided. Sometimes this means I don't come up with anything for a challenge, but that's not to say I haven't read your post and learnt something from the resources and the other entries. Thanks for sharing that, Dianne. I'm still playing with formats for the challenges. I would really like to separate the setup (examples, mini-tutorials) into a separate post. Some of what you wrote above validates what I've seen regarding the intro brief. That's totally okay with me, but I wonder if I would get more mileage out of the posts if they were separate from the challenge. What I'm playing with now is finding ways to make the challenges more like worksheets that only include the challenge, resources, and posting instructions. Resources could point to the set-up post as well as other examples. I always enjoy seeing what you share! And you're right about the various ways people take on the challenges. I don't worry about how closely people follow the challenge brief. Good point on why you (and others) participate. I know for many users it's about practicing something new. Those folks don't worry much about doing something unique or entirely creative because their focus is on using the tools. Other folks will try to do something out of the box each time while others only wish to build a solid portfolio. I'm really looking forward to meeting you in May! What will the weather be like over there? Thanks David. Soooo excited that you're coming to visit us in Melbourne! Unfortunately the weather won't be great then probably - it's the start of winter. Although it can surprise us - they say if you don't like the weather in Melbourne, just wait 5 minutes and it will change - and this is so true! I'm looking forward to having many conversations with you, but particularly about this community - now that it's got so many members and challenge participants it seems to be becoming a bit overwhelming in the current format. Sometimes I feel a bit guilty about not getting to comment on others' entries, but there's so many now that it's almost impossible to view and comment on them all. I'm finding that there's not enough hours in my day to absorb all the information in this community, let alone on the rest of the internet. One thing I do really like is the challenge recaps, which I think are a fantastic way to display all the entries, and the weekly recaps - these are great and at least if I get to see these I don't feel like I'm missing out on too much. Hey Ash, nice clean design! I also love how the push transition adds to the template interaction. Beautiful :) I really like your font style. What font is it? Very nice! What story size did you use? This is really sleek! I love the simple design of the orange and blue stripes on the side. Love it! Great idea to have a "style guide" slide right at the beginning! I love this (and the inclusion of the specs)! Hi, Linda. Unfortunately I have the language barrier and i don't quite understand "slick looking" - what does it mean? Can you explain it in common words, please. Thank you for explanation! Google, Yandex, and other online-translators give me this translation "slick=>скользкий=>slippery or greasy", so I was confused a little )). Thanks! It is the first time I'm sharing my file, it's a little exciting for me, but here it is: https://drive.google.com/file/d/0B-_R7jR2jYXWRG9KQjAxX19nSWM/view I'm appreciate for your attention. Very clean and trendy! I like that this looks like nothing else I've seen. Fantastic color scheme! Thanks for sharing, Alex! And again thank you all for your comments! Hey everyone! Thanks for the awesome start to this week's challenge. I just wanted to let you know that you're welcome to share your template files. I see some of you are already doing that so a huge thank you! We'll do a roundup of course starter templates in the next few weeks so please include your templates if you're able to share! Here is my submission with a blue photography theme. I'm sure some of the creative ones out there could envision using this theme for another subject by simply replacing the images to suit their needs. Demo - http://goo.gl/IiUBeU Storyline 2 Template - http://goo.gl/Yl629l Blog Post - http://goo.gl/s9JtyR I look forward to seeing everyone's submissions this week! I really like this one Lauren, clean design. Thanks, Linda! I've been trying to work on my "cleanliness" with design. 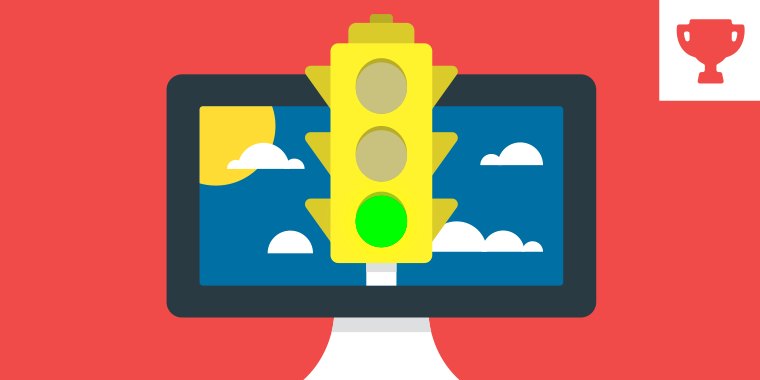 Learning a lot from these ELH Challenges! Great job Lauren. I like the color and clean design. I agree about the cleanliness. It's simple elegance. I especially liked the camera menu exercise. Adds to the user interaction. Thanks for posting this. No problem! I had a fun time making this one. I feel like this is a challenge I have often at work...making a template that fits! Love it! Great idea on the About the Author tab. I just might have to borrow that idea from you! I will second Linda. It is a very clean design, Lauren. Liked those arcs you have placed at the top of the slides. 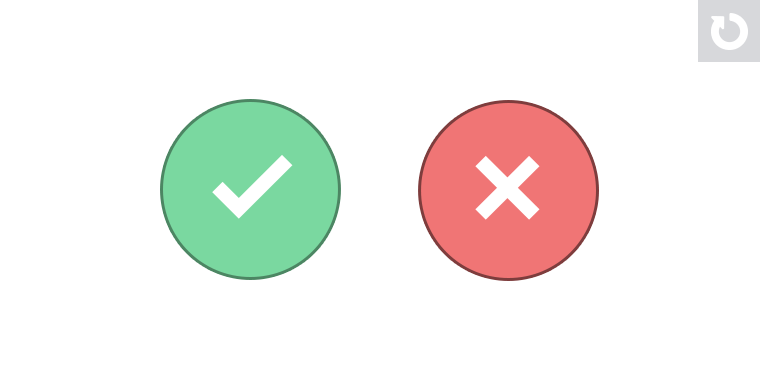 Great design Amar, I really like the hover state on your next/prev buttons and the objectives icons. Cool template Amar! I like the colors and animations that you used. Hey Amar, Loved that little underline you have for each selected tab. Also, loved the overall design, especially the color bars you have at the bottom. Thank you so much punam for appreciating. Nice and clean design Amar.! Wow! Nice work, James! I love that you can swap out the background photo to make this template work for just about any topic. Nice use of animations and blur. That's a wicked set of slide layouts, James! Such a beauty, James. Just loved it. Can one download it? Thanks for all of your comments :) I really appreciate it. Sorry Punam I can't share this one as it uses corporate images. Found the blur effects neat James! Wow. The background adds richness to your template. If this is a rush job, then your "non-rush" must be super incredible. Yes, love this Alexander, so well themed! Thank you for the great feedback @David I do admit the bullet cones was one of those ideas you feel awesome about when the creative juices get going ; ) I look forward to all these awesome challenges. Nicely done, Alexander. Loved the way you animated those cones. Also, liked the last bullet point. Thank you so much Punam. Veronica and Ashi, always loving your feedback. I join the cone-loving chorus Alex! 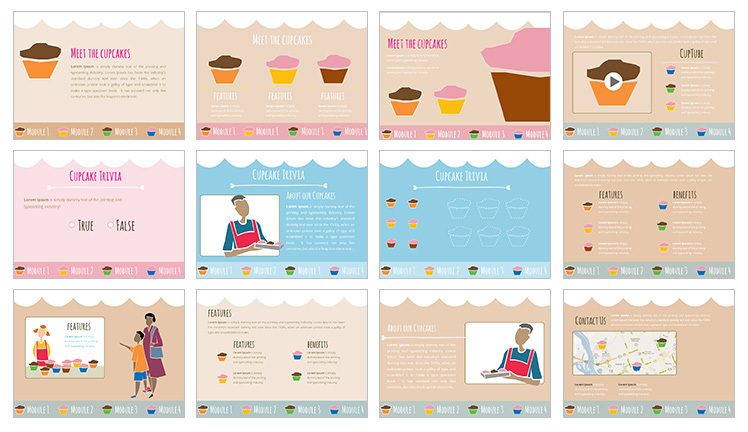 Hi everyone, I would have liked to include a few more layouts, but this will have to do for now: Demo, blog and download: http://veronicab.com.au/freebie-colourful-e-learning-template/ As always, feedback welcome! Love the colours and animations you have used Veronica. I like the happy, bright colours that you used Veronica. Veronica, the download template is not working for mine and I tried yours but it only gave the list of files that make up the output file. Do you think Google Drive is fading out earlier than scheduled? Loved everything. Great flow, colours, animation, video controls. Awesome Veronica! Hey Daniela, Thanks for checking. I think though that what you are seeing are some of the assets that I also threw into the folder (so my link is to the folder, not to the file itself). I think* others have been able to download it. The .story file is in that folder. Would you mind trying again? Hi Everyone, Here is my entry : http://thelearninggirl.byethost10.com/elh123/story.html Download: https://app.box.com/s/6giyvpldozbymg34czhbgaqrgvvl3k6c Do share your thoughts on this one. Beautiful looping design and workflow Punam. Well done! Very nice use of colour, animations, transparencies and variables - eye catching. Great variety of activities Punam! Well done! Here's this week's entry from Brett of Clearly Trained: http://clearlytrained.com/elearning-challenges/brett/123/story.html Use the up and down white arrows to navigate - some nice ambient audio as well! Ooh, I love it! I like the visual effect of the plant growing as you answer questions correctly, and I love the slight animations here and there, such as the water dripping off the leaf. I'd love to dissect your template and see how you did some of your effects. Very beautiful! Beautiful Eric, I love your use of video backgrounds. Thanks! All the parallax type animations were created with motion paths on pictures and then motion paths on the grouped pictures. Glad you liked it! Really Really Nice One Eric! As always, beautiful work Ashley! Like the soft colours and smooth transition Ashley! Very nice. 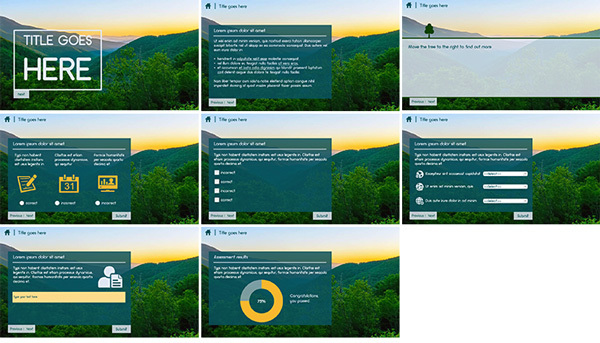 I particularly like the transparent overlay for your feedback on your quiz slide. Hey Cat, Unfortunately, I couldn't get past the markers. I clicked on the orange one and got the spinning wheel and just wouldn't move forward. That said, what I saw was really terrific: great colour scheme and graphics, very clean, great work! I had the same problem as Veronica, I thought my computer was just slow. The first part of it looks great though. Whoah! AWESOME design, so sleek and clean, gorgeous! Good to have you back again Josh! I really like this demo, and your use of photos and transparencies. Nice navigation "buttons" too. Um like I am loving this one. Thanks all! Slightly updated with an additional screen. I could tweak it until I hate it and that tends to happen (often), but I still like this one for now. :) Downsized the story to 1280x720 for the .story download file here: https://dl.dropboxusercontent.com/u/17849087/SLDGNS/ELH123/Course-Template-SL2-1280.story I kept the animations as they appear in the demo in case anyone is interested in how it is done (just copy and paste in new layer type of situation). Thanks for sharing the source file, Josh! I just updated your recap to include a download link: https://community.articulate.com/articles/course-starters-elearning#JoshStoner Fantastic week of templates and examples!